Try our Natural Chrysoprase Jewelry Satisfaction Guarantee - compare our prices and our superior quality. Click on any genuine chrysoprase jewelry image below to enlarge it. This pair of genuine chrysoprase earrings is set in 925 sterling silver studs with 8x6mm cabochon gems of genuine chrysoprase with natural pale green color. 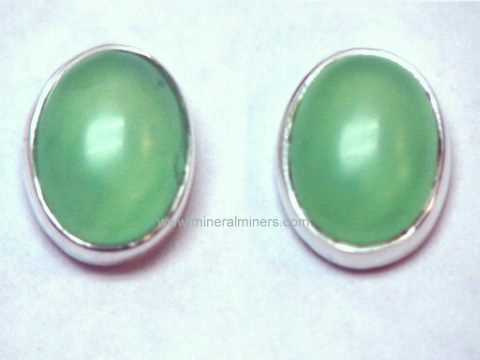 These oval shaped chrysoprase cabs were hand ground & polished from natural chrysoprase rough that was mined in Africa. See also a side view photo of these natural chrysoprase earrings. This is the end of our Natural Chrysoprase Jewelry page. See also our natural chrysoprase rough for lapidary use. To see more chrysoprase photos, just select another item category from the table below. To see photos of another mineral variety, select any item category link in our Mineral Inventory & Factsheet Index. Would you like us to inform you when we add on this page more natural color chrysoprase rings, natural color chrysoprase jewelry pendants and natural color chrysoprase bead necklaces and bracelets? We do have a limited inventory of additional chrysoprase jewelry items in stock, so be sure to let us know if you have any chrysoprase jewelry special requests. Please contact our webmaster or our 'site' geologist with any questions or comments.